I received a wonderful surprise recently - a phone call from Jeannette Rowe, one of Australia’s best selling pre-school authors. Jeannette called to tell me about a new digital initiative she has embarked upon. 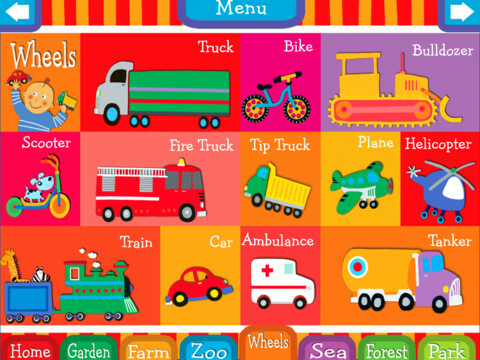 Giggle Kids Games is creating children’s apps for preschool and early school age children. These innovative apps are the first of their kind in Australia to combine established children’s picture books and games in such a highly interactive and educational way. 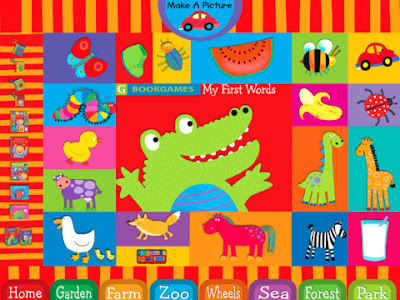 Jeannette says that the focus of Giggle Kids Games is to PLAY, READ, LEARN & GIGGLE. Initially developed for iPad (and soon available for iPhones and Android devices), the apps are available on the App Store. Enjoy this peek! The first thing you hear upon opening this hunt-and-spy app is giggling. Very very cute giggling. Then the author speaks (with her well-modulated and Aussie-accented voice - love it), asking you to high-four YoYo's paw in order to play. If you don't high-four the paw, there is no irritating, endless prompts to encourage you to do so. Love. If you do high-four the paw, carnival-like music begins and you're treated to some YoYo barking and a vocal prompt from the author to play. I actually really like this vocal prompt - it's warm and friendly and helpful for little ones. 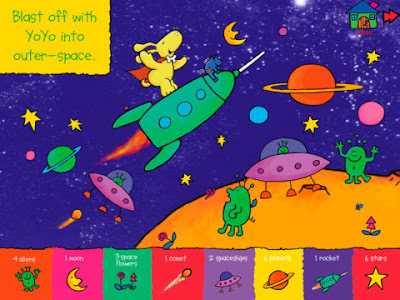 I did tap PLAY and I entered outerspace where I could tap on certain objects to count and find them. When I found all objects, I was presented with a winner trophy filled to bursting with all the bones I had one from my searching - very satisfying indeed. Once complete, there's a prompt for the next game - a pirate ship search, count and find. There are arrow options to move between games, a home button and increasing levels of difficulty as the games move on. Visuals are masterfully created, with subtle movement, luscious colour and delightful animations. The sound effects are adorable and unobtrusive. 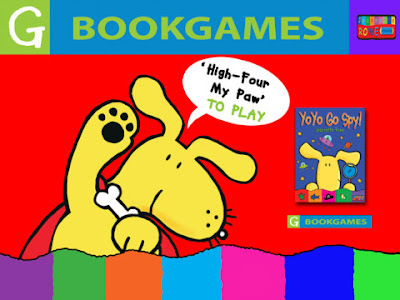 Kids can flick bones into YoYo's mouth at the end of all games, and return later to win more bones to flick into his mouth, and beat previous scores. In Smarty Cat: Frogs, kids are treated to a fully animated storybook on frogs and where they come from. Pages are scrolled through and read aloud by the author. 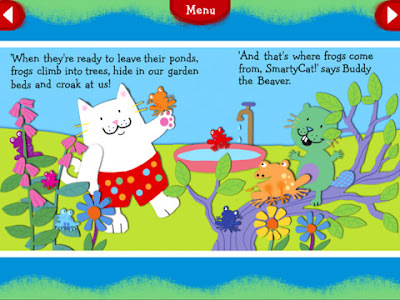 Although there are no interactive elements to the pages, movement and sound effects will enchant young readers. 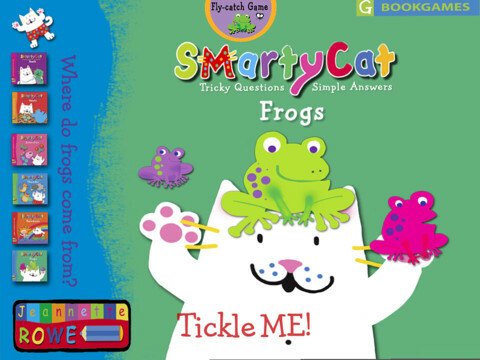 Interactivity can be found on the home page in the form of the Fly-Catch Game, where kids can have fun catching their own little buzzers. 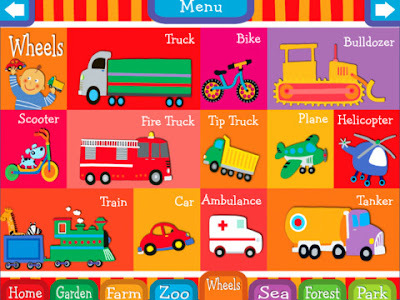 In My First Words, I felt instantly propelled back to toddlerhood. The very young would go bananas over this app. A vivid opening page with animated squares is enough to send you into rapid-fire touch mode and carnival music is enchanting, not irritating. There are several categories featuring touch-and-name boxes that kids can repeat out loud. There's even an option to alter the words used yourself - perhaps changing the words to a foreign language. Kids can also create their own picture using images that can be clicked and dragged to a scene. 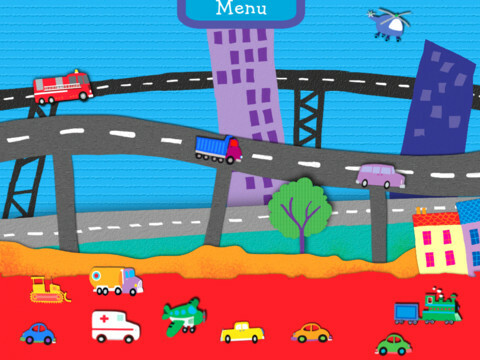 In this city scene, vehicles added actually move (and honk and beep) - which is very cool. I would have loved to have seen some more scene options here - perhaps these will be added in later editions. 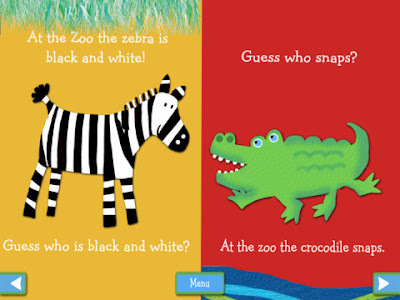 Kids adore visiting the zoo and this app will certainly fulfill that desire. Kids can either play Guess the Animal or Zoo Memory Game. 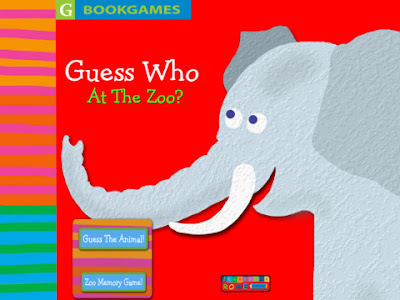 In Guess the Animal, kids can revisit the type of books Rowe is renowned for. Animals are covered over and kids can first guess from text and vocal prompts before swiping away the coverings to reveal animated critters. The animations are beautifully done. In Zoo Memory Game, kids play this classic matching game by flicking the cards over to reveal pairs. Who doesn't love this game? Complete with sound effects, too - and in fact, if the child selects cards rapidly, the entire room fills with a menagerie of animal noises - brilliant. Although I enjoy having the author read and guide kids aloud, there is also an option to turn the voice off.